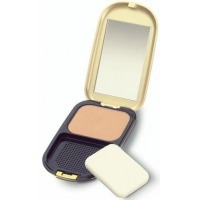 The ideal face powder exists! I’ve been searching for it for so long! I kept buying face powders one by one, and each of them was a failure, which made me look as though I was wearing war paint. The real stunner! The Max Factor Miracle Touch Foundation in 40 Creamy Ivory is now my must-have. The curved brush requires some skills. The mascara is great, but the brush is unusual. I’ll tell you how much I was surprised by it.